With just a box label to go on, it can very difficult to learn just what’s in your horse’s supplements and why it makes a difference. 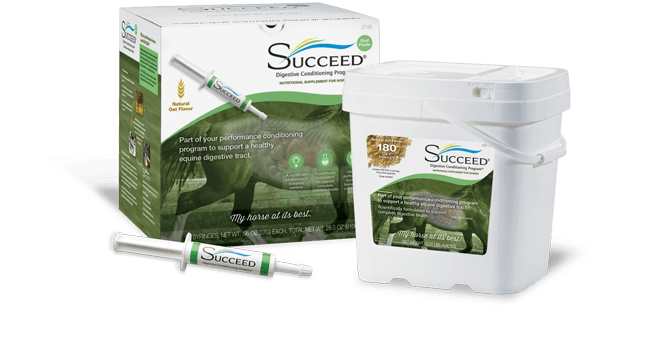 In Parts 1 and 2 of What Goes In SUCCEED, we explained how equine supplements are regulated and how that affects our label followed by the benefits of Oat Flour in SUCCEED. In Part 3 we will discuss the benefits of Oat Oil (it’s the polar lipids) in SUCCEED. Subscribe to the blog for parts 4 and 5 on the benefits of the irradiated dried yeast on our label and the synergy of all of the ingredients in SUCCEED. If you’ve already read parts 1 and 2 of this series, you’re probably starting to understand why there’s a lot more to SUCCEED than what you see on the label. As with oat flour, we have to follow state feed regulations and AAFCO guidelines when it comes to how we describe all our ingredients. One of the primary ingredients in SUCCEED is listed on the label as oat oil. But what is truly useful in our oat oil is the high concentration of polar lipids it contains. Act as a ferry for other nutrients – Polar lipids provide an ideal nutrient delivery vehicle for both fat- and water-soluble vitamins, minerals and other nutrients (including other ingredients in SUCCEED). This increases their bio-availability, so the horse gets the maximum benefit from these nutrients. Improve ability to absorb nutrients fully – Fat-soluble nutrients include vitamins A, K, D, and E. Polar lipids have been shown to increase the digestive tract’s ability to absorb these vital nutrients from a horse’s feed. Strengthen the protective barrier in the intestine wall – Dietary polar lipids are important in forming the tight junction between the epithelial cells lining the gut. Cells connected in this way create a unified barrier that naturally blocks digestive juices, toxins, and pathogens. Adding polar lipids to the diet has been shown to protect the intestinal membrane and strengthen this barrier. Boost the immune system – SUCCEED oat oil is also rich in powerful antioxidants that sweep free radicals out of the system before they can damage the surrounding tissue. Promote healthy brain function – Lipids are also essential to the brain and have been found to maintain neuronal organization and function. Increase energy needed for training and performance – After transporting nutrients, polar lipids are absorbed in the gut where they supply extra energy to your horse. All of this means your horse will get more from less food – grains and concentrates specifically (we always advocate free access to quality hay or pasture grass). 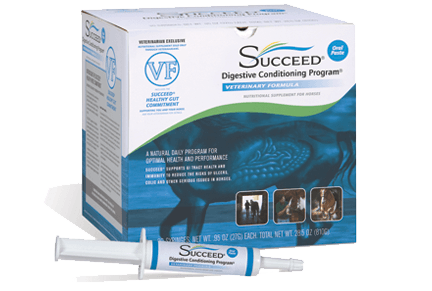 This is good for your horse’s weight, health, and hindgut – as well as your bank account. Hexane extraction destroys polar lipids – Manufacturers commonly use a process called hexane extraction that actually destroys polar lipids. This method of extraction is generally what you will find in the oat oil you might find on the shelf at the grocery store, giving your horse very little benefit. Ethanol extraction retains polar lipids – SUCCEED uses a method called ethanol extraction that retains a greater proportion of the polar lipids. Our extraction process is proprietary – which means you can’t get the same concentration of polar lipids from any other forms of oat oil. The SUCCEED difference is in the processing we use that maintains the highest concentration of polar lipids possible in our oat oil. Our mission is to give your horse a product that will help it consistently perform at its best. We believe that one of the most beneficial things we could offer is optimal nutrient absorption. Without the right nutrition, your horse will not be able to be who it needs to be. The oat oil is only part of the whole that makes SUCCEED what it is. Along with the magic of oat oil are other ingredients that contribute to total internal wellness. And when your horse is feeling well on the inside, it’s going to feel well on the outside too. Subscribe to the blog to see parts 4 and 5 of What Goes In. In Part 4 we’ll be exploring the Irradiated Dried Yeast that supports a healthy hindgut, natural immunity, and the growth of intestinal villi.